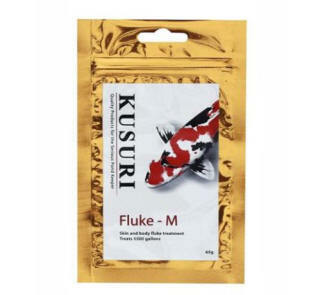 Kusuri Fluke M is a 50mg/g Flubendazole medication used to eradicate Gill and Body Flukes. This treatment is safe to use without destroying your filter bacteria. It can be used at any temperature. While dosing with Fluke M you can continue to feed. This product is designed as a one off treatment, but may require a second dose after 7 days in heavy infestation. Alternatively you can use Kusuri Fluke P or Kusuri Fluke S after 7 days. Dosage: 11.8g per 1000 gallons (4546 Litres) of pond water. For best results use above 15°C. Kusuri Fluke M stays active in the water for a total of 7 days. If the mucus layer is excessive, we advise dosing with Chloramine T at 15g per 1000 gallons, 12 hours before using Fluke M, this will assist in reducing the mucus membrane where body flukes can sometimes get trapped. Kusuri Fluke M is not an invasive, toxic medication like Malachite Green and Formalin 30%. The Flubendazole is absorbed by the flukes and dissolves their digestive tract that subsequently starves the parasite. Fluke M may require a second dose after 7 days in heavy infestations. Kusuri recommend a mucus scrape and microscope identification prior to a second application. Fluke M is safe to use with all cold water ornamental fish and all tropical freshwater fish. Do not use Fluke M with Sting Rays. Fluke M should be used within three months of opening. Fluke M can also be used for the eradication of pond snails, Intestinal Helminths and Worms. For exradicating Lice, Anchor Worm and Argulus, use 3 doses of Fluke M 7 days apart. For best results use above 15°C. At 10°C a second dose may be required. Please ensure that you read the instructions for use and understand and follow, all Health and Safety guidelines on the packet.